Lixit Pill Popper -- Pet Piller. $2.25. "Your service with my order was excellent!" Your service with my order was excellent! Pill popper is marginal (too small for some pills) - had to buy a better one. Hard to rate this product as the capsule didn't fit inside it. wheaten terrier. Family pet. Competes. The longer thinner one reachs back in better,but this is way worth the money. On larger capsules I open up the pill and put in a small bowl with water in it,this allows you to suction it into the piller. Some dogs can shake out any pill but the liquid gives you another option. A capsule doesn't fit in the end. A regular pill might be ok but my dog had capsules. Ended up manually giving her the capsule. The Lixit Pill Popper can be used with or without liquid to easily administer pills to your dog. 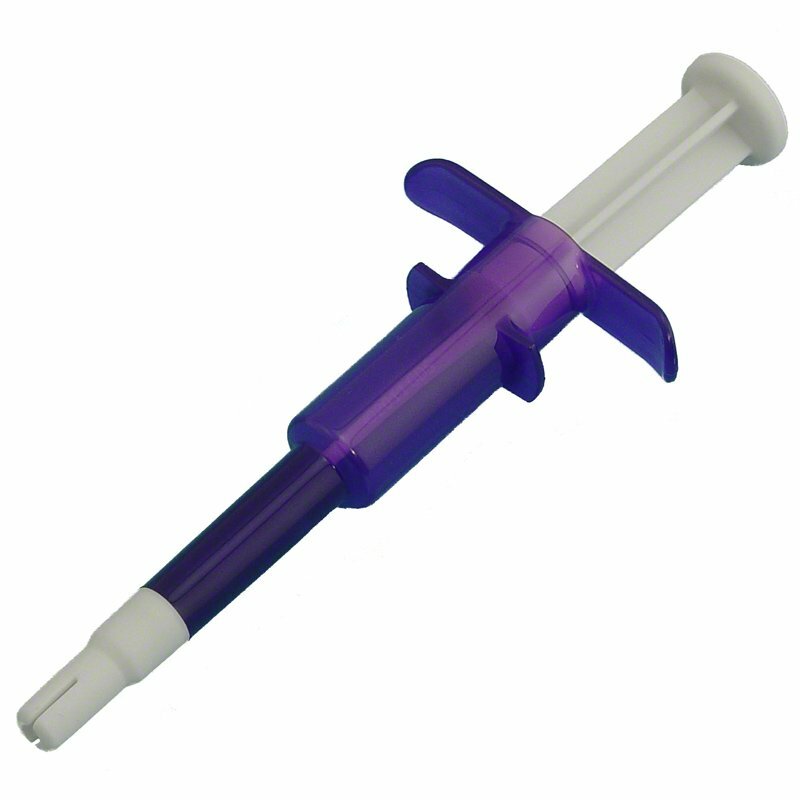 Features a soft flexible tip designed to protect the throat and fit various pill sizes. Hand wash only. Made in the USA. Pull back plunger and insert pill into white tip. Firmly grasp pill popper with fingers under purple tabs. Hold pet's mouth open and insert pill popper. Place white tip toward the back of the throat. Press plunger to eject pill into pet's mouth. Liquid such as water or milk can be used to aid in pill swallowing. With plunger depressed, place pill popper tip into liquid. Pull back on plunger until liquid fills pill popper body. Invert pill popper and place pill in white tip. Firmly grasp pill popper with fingers under purple tabs. Hold pet's mouth open and insert pill popper. Place white tip toward the back of the throat. Press plunger to eject pill and liquid into pet's mouth.